Published 9/8/2013 . Last updated 3/29/2019 . Sweet fried plantains (an extra starchy banana variety) are my weakness. Given that I have made a lunch of plantains alone, it was only a matter of time before fried plantains showed up in cupcakes. I developed this plantain cupcake recipe for FEAST Magazine and used some of my other favorite flavors – brown sugar and spiced rum – to make the cupcakes pop. 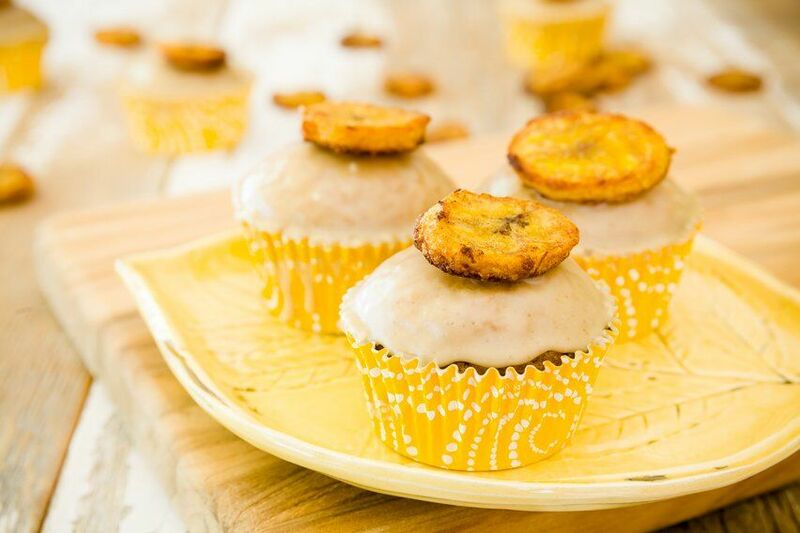 I think of these plantain cupcakes as a Latin-inspired cross between Bananas Foster and coffee cake. I topped the plantain cupcakes with a brown sugar rum glaze and homemade sweet plantain chips. Even if you don’t make the cupcakes, make the chips. They are chewy, slightly sweet, and if you overcook them just a tad, they’ll have crispy, sugary edges. In addition to these cupcakes, the FEAST story was all about my favorite gadget. After careful consideration, I decided that my favorite gadget is my mixing bowl set. I wasn’t sure if mixing bowls even counted as gadgets, but FEAST said they did. These are by far the best mixing bowls I have ever owned. The spouts are designed to fit perfectly on the edge of a stand mixer bowl so that you don’t spill when you pour. They really work! I also love Pourfect’s measuring cups and spoons. The sets include so much more than the standard cup and spoon measurements and it’s surprising how often I use the odd sizes. I use the two-cup measuring cup all of time (the same applies to the two tablespoon). Has anyone tried this tea? Given my love for plantains, I am adding this to my to-try list! I think of these as a Latin-inspired cross between Bananas Foster and coffee cake. I topped the plantain cupcakes with a brown sugar rum glaze and homemade sweet plantain chips. Melt butter in a large skillet on medium-low heat. Peel plantains and slice into ¼-inch thick slices. Add plantain slices to skillet and cook until bottoms turn golden, about 5 minutes. Flip and continue to cook for another few minutes. Add brown sugar to the skillet and stir to coat slices. Remove from heat. In a food processor, combine 1 cup cooked plantains to yield ¾ cup mashed plantains. Place remaining slices in a single layer on a parchment-lined cookie sheet and sprinkle with cinnamon. Flip and bake plantains for another 8 minutes, until exteriors harden. In a medium mixing bowl, whisk together flour, salt, baking powder and baking soda. In another medium mixing bowl, mix brown sugar, mashed plantains and eggs. Mix in vegetable oil, vanilla, rum and milk. Slowly add dry ingredients to wet ingredients, mixing until just combined. Bake for 18 minutes or until a toothpick inserted into the center of a cupcake comes out dry. Continue to stir until flames subside. Spread glaze over cooled cupcakes and top with a plantain chip. If you can't find plantains near you, you could make this recipe using underripe bananas. Be sure to check out the FEAST article to see the other featured St. Louis Food bloggers: Kimberly from Rhubarb and Honey, Stacy from Every Little Thing, Shannon from A Periodic Table, and Malou from Skip to Malou! Speaking of FEAST: Do you remember these moonshine and sweet tea cupcakes? Well, they were featured on FEAST TV today. If you weren’t able to watch the show (it only airs in St. Louis), you can watch the video below. Publisher Catherine Neville walks you through all of the steps to make these moonshine cupcakes! What a neat idea to add plantains! Never dawned on me :) YUM!